One major result of the Helsinki summit has been overlooked in the furore over Russian election meddling—Donald Trump and Vladimir Putin essentially agreed to an endgame to the Syrian civil war. The basic outlines of the deal are now clear, experts say. Syrian President Bashar al-Assad will remain in power, there will be a permanent ceasefire between Syria and Israel (after seventy years in a state of war), Damascus will offer guarantees regarding the Jewish state’s security—first and foremost by moving Assad’s Iranian military allies away from Israel’s borders. [post_ads]With the final defeat of ISIS at hand, Trump has been looking for an exit strategy in Syria. Israel’s Prime Minister Benjamin Netanyahu and Russian President Vladimir Putin have provided one for him. And the final deal is likely to be one largely brokered by intensive diplomacy by Israel. But the true diplomatic bombshell was that Netanyahu signaled that Israel, despite earlier repeated calls for regime change in Syria, was now fine with leaving Assad in power. Netanyahu’s reasoning is simple—Israel is much more concerned about Iranian military presence on its borders than it is with the survival of Assad. Netanyahu has also been lobbying for years against Russian plans to sell Assad an S-400 air-defence system, which could successfully down Israeli planes over Syria. Putin, after long prevarication, this year finally bent to Israeli persuasion and agreed to shelve the sale of the S-400s. At the same time, Putin has also been holding intense talks with the Iranians. Moreover, the Kremlin is already acting as a de-facto intermediary between Washington and Tehran, who have had no formal diplomatic relations since 1979. Privately, however, the true focus of the discussions was enlisting Russian help with a growing economic crisis in Iran sparked by Trump’s announcement that oil sanctions would be re-applied to Iran after November 4th. Since the talks, Russian energy giants Rosneft and Gazprom have already announced that negotiations are under way with Iran’s Oil Ministry on oil exploration deals worth up to US$10 billion. What Moscow—and Israel—need from Iran is the withdrawal of the Iranian Revolutionary Guards units and their Lebanese Hezbollah militia allies that turned the tide of the Syrian civil war in Assad’s favour. With Saudi Arabia and the United Arab Emirates said to be behind Israel, and Turkey scrambling to fall into line behind Russia, it’s a done deal. Mr Assad, in short, is here to stay—and the West must now begin the process of coming to terms with the fact that it backed the losing side in the Syrian civil war. Israel has already offered Assad a stark choice—persuade his Iranian allies to leave, or face escalating airstrikes. "If Assad continues allowing the Iranians to operate out of Syria, it would be the end of him, the end of his regime," Israeli Energy Minister Yuval Steinitz threatened in June. An escalating series of Israeli airstrikes against Iranian units inside Syria have driven the message home. Yet reports from the ground suggest the opposite. In late June, the Syrian Observatory for Human Rights (SOHR) reported that a large force of Iran-backed militants were seen withdrawing some 40 kilometers (25 miles) from Syria’s border with Israel along the disputed Golan Heights. That paves the way for a normalization of relations between the two countries for the first time in a generation. The question is just how far is far enough to satisfy Israel. Moreover, Russia has a whole set of common interests with Iran beyond Syria—for instance their maritime border in the oil-rich Caspian sea, Islamic militancy in the Caucasus, and relations with oil-rich states of Central Asia. “I don’t think that the Russians are going to go into the diplomatic glassware shop and start breaking a lot of glass just to make Donald Trump and the Neocons happy,” says Ford. Nonetheless, its clear that Russia is only too happy to allow the US to withdraw from Syria, effectively leaving the country a Russian protectorate. Putin is more than willing to sign off on any Israeli-brokered deal that leaves his ally, Assad, in power. Just how much Iran can be persuaded to back down and pull out of Syria remains a sticking point, but with new US sanctions looming, Tehran desperately needs Russian money. The only losers in the deal are likely to be the Syrian opposition which the US once backed and have now effectively abandoned. 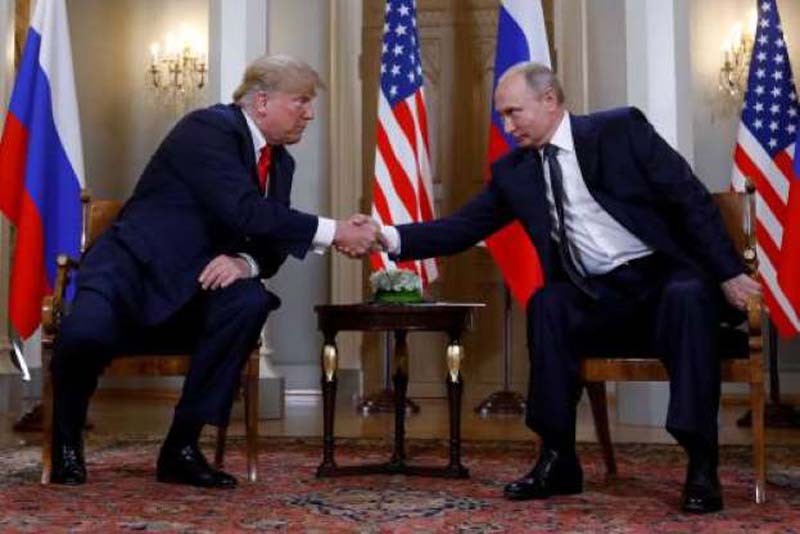 World - U.S. Daily News: Did Trump and Putin Agree on Plan to End Syrian War?